ACA utilizes the following airports to fly clients privately to/from Phoenix and neighboring areas of Arizona and the Southwest United States. There are 20 airports available within 50 miles of Phoenix for your private flight, many of which operate private FBO terminals for fast, efficient arrivals & departures. Check out the information below and contact one of our advisors to review all of the options for your upcoming flight to/from Phoenix, Arizona. Book a private flight to Phoenix Sky Harbor International Airport (IATA: PHX, ICAO: KPHX, FAA LID: PHX), a civil-military public airport located 3 miles southeast of downtown Phoenix. 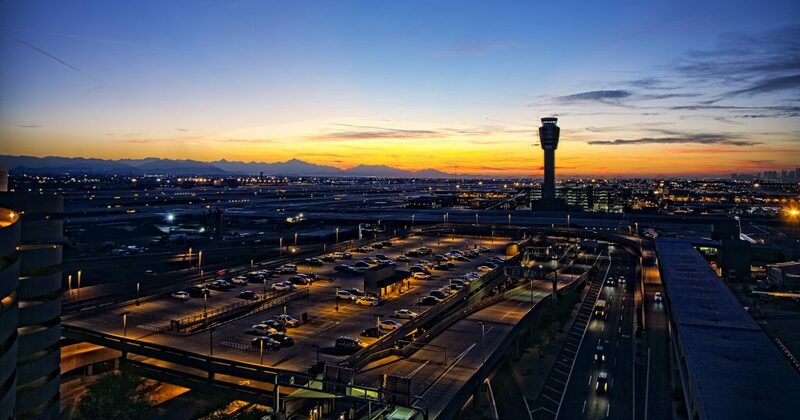 It is the largest and busiest airport in the state of Arizona, and among the largest commercial airports in the country. Hire a private jet into Glendale Municipal Airport (ICAO: KGEU, FAA LID: GEU), a city owned, public use airport located 7 miles west of Glendale’s central business district in Maricopa County, Arizona. Glendale Municipal is categorized as a general aviation reliever airport, and included in the National Plan of Integrated Airport Systems. One of the country’s most popular hubs for private aviation, Phoenix Deer Valley Airport (IATA: DVT, ICAO: KDVT, FAA LID: DVT) is a public airport located 17 miles north of Phoenix. In 2010, Deer Valley ranked as the 25th busiest airport in the world by aircraft movements, with a total of 368,747 aircraft movements. There are two asphalt runways offered by the airport: 7R/25L, measuring 8,196 feet in length, and 7L/25R, coming in at 4,500 feet long. Cutter Aviation operates the only FBO at (KDVT) Deer Valley Airport. Phoenix Goodyear Airport (IATA: GYR, ICAO: KGYR, FAA LID: GYR), formerly known as Goodyear Municipal, is a public airport located just a mile southwest of Goodyear in Maricopa County. Phoenix Goodyear is home to several aircraft maintenance and commercial pilot training companies, including AeroTurbine, Airline Training Center Arizona (ATCA), and Oxford Aviation Academy (OAA). (KGYR) Phoenix Goodyear features a single 8,501 foot asphalt runway (3/21), and a concrete helipad(H1) measuring 64 x 64 ft (20 x 20 m). Lux Air operates a 24 hour FBO at the airport. Book your private flight to Scottsdale Airport (IATA: SCF, ICAO: KSDL, FAA LID: SDL), located 9 miles north of downtown Scottsdale in Maricopa County, Arizona. It’s one of the busiest single-runway facilities in the United States, despite the large number of local noise complaints. Scottsdale Airport features a single 8,249 foot asphalt runway (3/21), and there are two FBOs available, one operated by Signature Flight Support, and the other by Ross Aviation. Stellar Airpark (FAA LID: P19) is a small, public-use airport and residential airpark in Maricopa County, Arizona. Stellar Airpark features a single 3,913 foot asphalt runway, ideal for landing smaller turbo-props and piston aircraft. The airport is privately owned by the Stellar Runway Utilizers Association. Have any questions regarding Phoenix-area private airports for your upcoming flight? Call us at 1-888-987-5387 to speak with one of our brokers and review the options for your flight to Phoenix, Arizona.